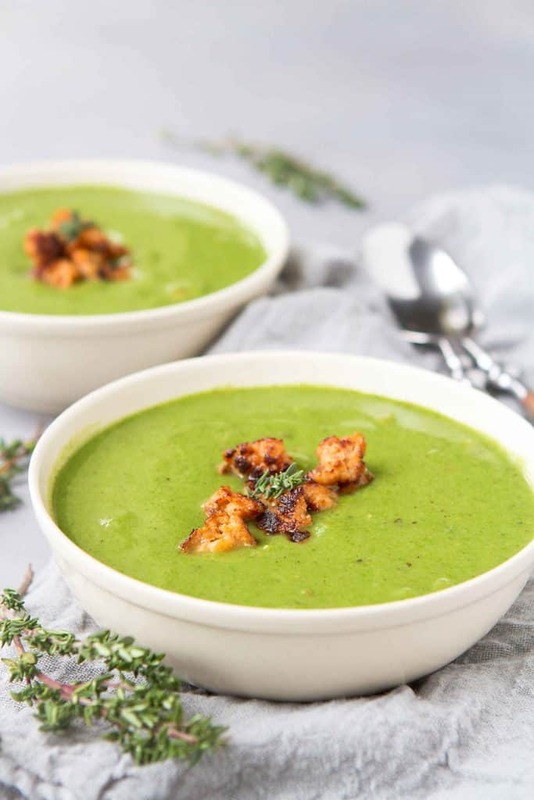 When you’re craving a comforting, healthy meal, this Cauliflower Spinach Soup is the way to go. Tons of flavor from the veggies, broth and sausage. Thank you to Zoup! Good, Really Good Broth™ for helping me share this recipe with you. When it comes to healthy eating, there is nothing more satisfying than a really great soup recipe. The beauty of soups is that you can make them to fit almost any taste preferences or diet necessities, whether it’s vegan, gluten free, Whole 30 or paleo. 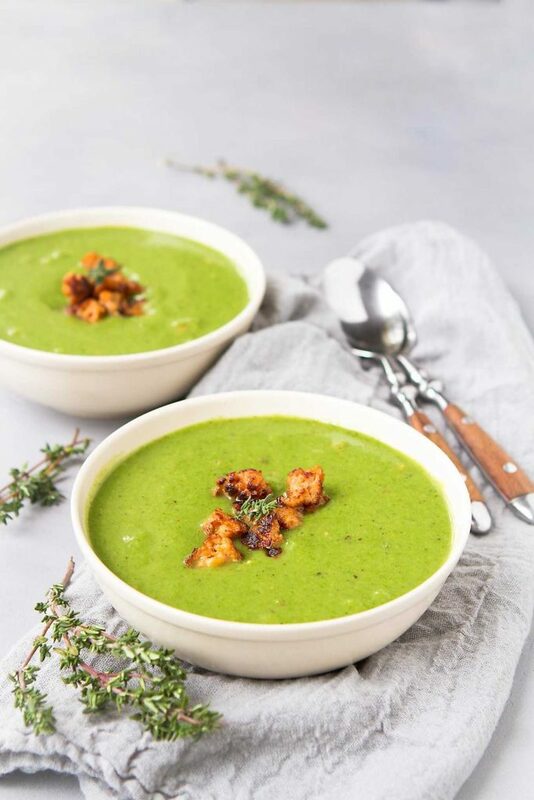 This cauliflower spinach soup happens to tick off a couple of those boxes, plus it’s dairy free. If you’re familiar with the general formula of a good soup recipe, you can pull together a tasty, healthy meal with ingredients in your fridge or pantry. No need to make a special trip to the store! Since this is a blended soup, let’s start with my best tips for making a creamy low fat soup that doesn’t involve cream! The broth is everything! Since broth is the main ingredient for most soup bases, taste if key. Veggie broth, beef broth, chicken broth…if you don’t like the flavor of the broth on its own, chances are you’re not going to be happy with the flavor of the soup. When I first tasted the Zoup! 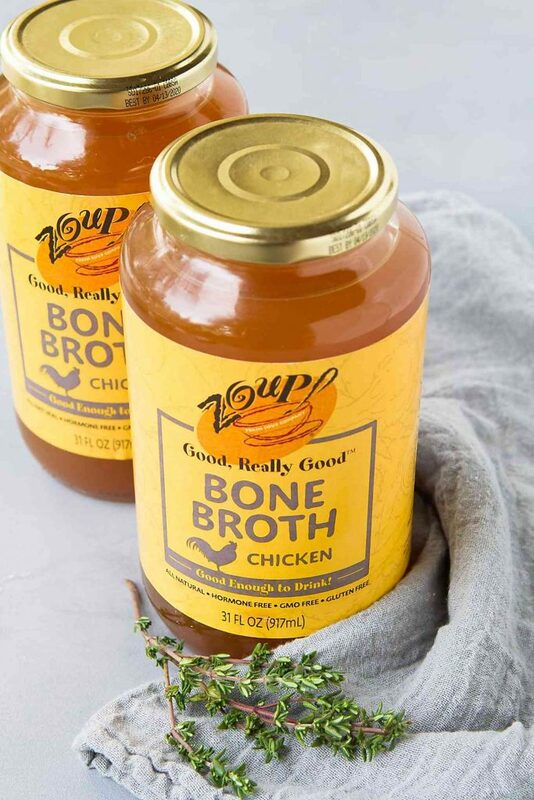 Good, Really Good™ Chicken Bone Broth, I knew that my broth search was over. I could happily sip on a mug of it every day! Could I make my own broth? Sure. And sometimes I do. But let’s get real…that’s just one of those kitchen tasks that falls to the bottom of the priority list. So, having a great store-bought brand on hand makes soup making so much more appealing. Boost the flavors with aromatics – garlic, onions, shallots, peppers, celery and so on – and herbs, either fresh or dried. Sauté the aromatics, except garlic (it becomes bitter if overcooked) until tender or starting to brown if you want a slight sweetness from the onions. Next, add the garlic and herbs, and cook for another minute before stirring in your main ingredients and the broth. When making a blended soup, you have two options for achieving that smooth, creamy texture. The easiest option is blending the soup in the saucepan using an immersion blender. If you don’t own an immersion blender, then a regular blender will certainly do the trick. HOWEVER…be sure to first let the soup cool for about 10 minutes, blend the soup in batches, hold the lid on the blender while pureeing and pause the blender periodically to release the steam. Those tips come from a person who has ended up with hot soup on her ceiling a time or two. For this cauliflower spinach soup, I mixed in and garnished with some browned Italian chicken sausage to add some extra protein and flavor. And let’s face it, sausage makes everything better! Use the Zoup! Good, Really Good Veggie Broth and omit the sausage for a vegan version. Zoup! got started in the soup business as a fast-casual chain of restaurants that features 12 rotating soups each day. It’s safe to say they know a thing or two about making good soups! They now also cook restaurant-quality broth in kettles in small batches, which is bottled and sold in grocery stores. Low in calories, paleo-friendly, and free of GMOs, hormones, gluten and fat, trans fats and saturated fat they’re a fantastic base for any soup recipe. Zoup! Good, Really Good™ Broths can be purchased at retailers nationwide, including Albertsons, Safeway, The Fresh Market, Giant, Giant Eagle, Kroger, Rouse’s, Gelson’s, Central Market and Fresh Thyme. 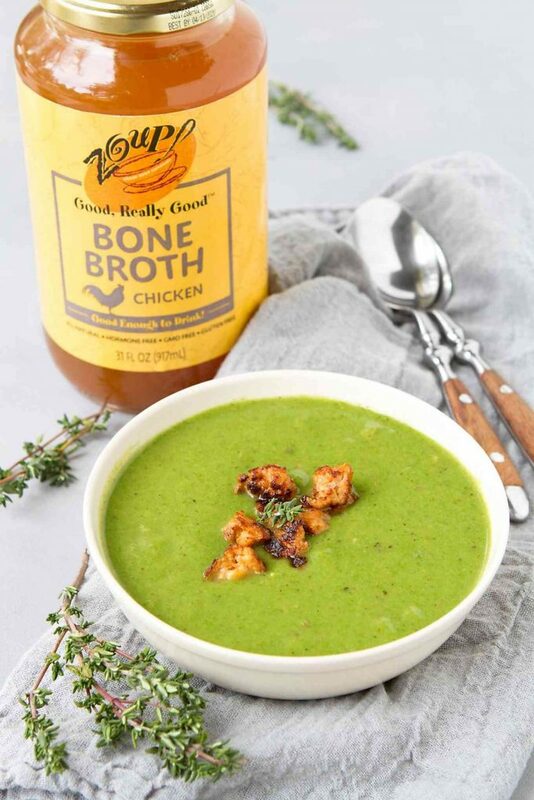 Contact info@zoupbroth.com with any questions or connect with them on Facebook, Instagram and Twitter. Be sure to use this coupon offer (the coupon will pop up on the site) when buying Zoup! Good, Really Good™ Broths! Heat a large nonstick or cast-iron saucepan over medium-high heat. (If the saucepan is not nonstick, lightly coat with cooking spray.) Squeeze the sausage out of the casings into the skillet. Cook, breaking up the sausage with a wooden spoon, until cooked through and golden brown. Transfer the sausage to a bowl and set aside. Reduce the heat to medium. Heat the olive oil in the saucepan, then add the onions. Cook until light golden brown, stirring occasionally, about 4 to 5 minutes. Add the garlic, thyme, and cook for 1 minute. Add the cauliflower and stir until combined. Add the broth, bring to a boil, then lower heat and simmer until the cauliflower is very tender, about 15 minutes. Remove from the heat. Stir in the spinach until wilted. Use an immersion blender to puree the soup until very smooth. Alternatively, process the soup in a blender in two batches, pausing periodically to release the steam from the blender. Stir in the ¾ of the cooked sausage. Ladle the soup into four bowls, then garnish with the remaining sausage. Serve. Filed Under: Entrees, Gluten Free, Healthy Dinner Recipes, Soups Tagged With: broth, cauliflower, clean eating, healthy, recipe, sausage, spinach, Zoup!